Obviously, right? 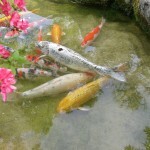 Koi are the most popular pond fish out there, and with good reason. They come in a huge variety of different colors and patters. You can find koi in solid colors, multi colors with intricate scale patterns, and even a very unique scaleless variety that transforms throughout its life. 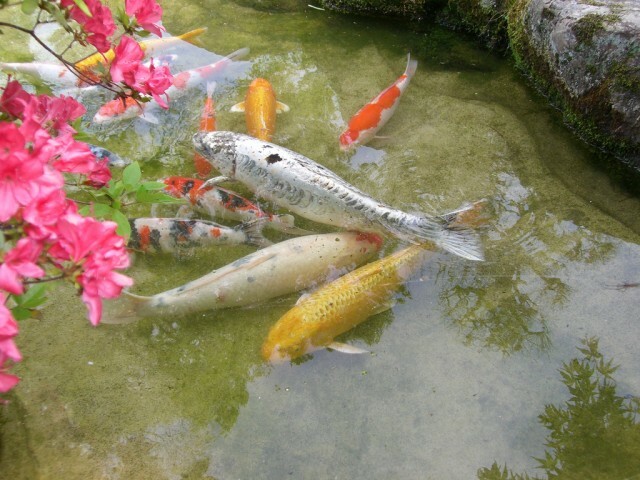 When looking to purchase koi fish for your Kalamazoo pond, you may notice some varieties are much more expensive than others, this is because koi are priced based mainly on their color, color pattern, their size and even their bloodline. Some varieties of koi are more docile and apt to be the first to take food from your hand, which is one of the delights a pond owner has when owning koi! Koi can get quite large, so make sure not to stock your pond with too many fish. The r ule we like to follow is 10 gallons of water for every inch of fish. 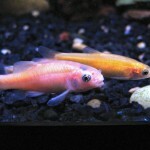 Rosy red minnows tend to be overlooked because of there size, but they work great in ponds of any size. They are brightly colored, coming in shades of orange, white, and light pink/orange, and they are very easy to care for. They also are very hardy and well adapted to colder climates, which means they will over winter in a Kalamazoo pond quite easily, as long as the pond is winterized properly. These little guys also multiply easily, so you may have a constant presence of juvenile minnows. Yes, the same fish you would catch at the lake when you were a kid, make good fish for your Kalamazoo pond. 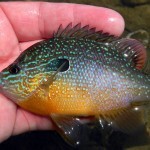 Sunfish are also often overlooked as pond fish, but they actually can make a really great addition to your pond. They are hardy and well adapted to cold climates and winter water conditions. And, they can be very colorful. The Longear sunfish and Orangespotted sunfish are two very colorful varieties, that are also native to our area. Make sure not to add many to your Kalamazoo pond, they can take a pond over if their population is not kept in check. These are just our top 3 fish to add to your pond, there are many more varieties of fish out there that would love to call your Kalamazoo pond home. If you would like other suggestions of fish, or if you’d like to purchase fish for your pond, be sure to contact us to get started. Take a look at some recent projects we have completed, as well as our frequently asked questions that is filled with a wealth of information!